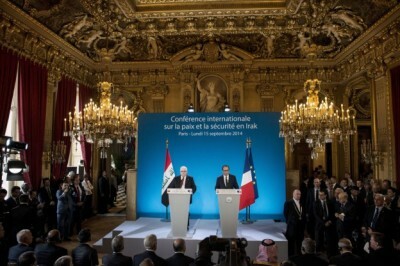 A French-sponsored, US-backed international conference on “peace and security in Iraq,” held in Paris Monday, brought together most of the world’s great powers along with a majority of the Arab states to offer political, economic and military backing to the government in Baghdad. This sweeping agreement was backed by 13 NATO members, including the US, Britain, France, Germany, Italy, Canada and Turkey, and 10 Arab states—Saudi Arabia, the United Arab Emirates, Bahrain, Egypt, Iraq, Jordan, Kuwait, Lebanon, Oman and Qatar—as well as by Australia and Japan, the two principal Pacific allies of Washington. The communiqué was also signed by the foreign ministers of Russia and China, which have been at odds with US policy in the region, and particularly with its efforts to overthrow the government of President Bashar al-Assad in Syria. It was to gain the support of Russia and China, as well as several of the NATO countries that might otherwise have balked, that the communiqué made no mention of action against ISIS in Syria. However, the commitment to “eradicate” the group, which controls nearly all of the eastern half of Syria, opens the door to such action. In a clear signal that the Assad regime remains the central target of the US-led campaign against ISIS, both Syria and its ally Iran were excluded from the Paris conference, even though these two countries have done more to fight ISIS than any of those participating. Syrian troops have been fighting ISIS forces for three years, a period in which the group received significant aid, directly or indirectly, from Washington, as one of the “rebel” groups seeking to overthrow Assad. Iranian military advisers worked actively with Shiite militia forces in Iraq that retook several towns in Dyala province from ISIS earlier this month. Iran denounced the US effort to cobble together a Bush-style “coalition of the willing” for a new war in Iraq. Iranian Supreme Leader Ayatollah Seyed Ali Khamenei said the US was “planning a war … to dominate the region,” an assessment that is certainly accurate. In an indication of things to come, French fighter jets made their first sorties over Iraq Monday as the conference was meeting in Paris. They flew from the French airbase at Al Dhafra in the United Arab Emirates, conducting reconnaissance of ISIS positions in Iraq and target-spotting for US warplanes that carried out the actual bomb and missile attacks. The new Iraqi prime minister, Haider al-Abadi, told state-run television station al-Iraqiya Sunday that he had given approval for French forces to use Iraqi airspace for actions against ISIS. His first interview since taking office was thus a declaration of Iraq’s subordination to French imperialism, one of the former colonial powers in the region. This brings to five the number of countries that have committed forces to military operations in Iraq—Britain, France, Canada and Australia, in addition to the United States. A key section of the communiqué commits all of the participating countries to engage in stepped-up repression against their own populations. This is described as “measures to prevent radicalization, coordination between all security services and stricter border control.” Britain, France and Germany have all taken steps to crack down on citizens who visit the Middle East conflict zone and then return, particularly if they are Muslim converts or immigrants from that region. Despite the efforts to portray ISIS as a vastly powerful and globally dangerous force, the group’s offensive in Iraq has already been halted by US bombing, according to Pentagon officials. The group remains on the march in Syria, using US military equipment captured in Mosul, Iraq’s second-largest city, to push back its rivals among the US-backed “rebels” and overrun isolated units of the Syrian regime’s military. But crimes such as the beheading of three prisoners, two American journalists and a British aid worker, have been given wide publicity by Western governments and the corporate-controlled media in an effort to neutralize popular opposition to a renewed imperialist war in the Middle East. The State Department announced over the weekend that retired Gen. John R. Allen, a former US commander in Afghanistan and former head of the US Central Command, which supervises operations in Iraq, Afghanistan and throughout the Mideast, had been named to coordinate with those countries contributing military forces to the campaign against ISIS. The exact tempo of the air strikes in Iraq and the timetable for extending the attacks into Syria remain unclear, dependent on both the movement of ground forces within Iraq and the level of support provided by NATO and Arab countries. But the New York Times drew attention Monday to the scheduled rotation of the carrier George H. W. Bush, now in the Persian Gulf, and the Carl Vinson, which is to replace it. This means that in October, the Pentagon “could double carrier-based firepower over Iraq and Syria,” the Timesobserved. On the same day that the Paris conference took place, members of the US House of Representatives assembled in Washington for a brief session before the House recesses for the final month of the congressional election campaign. House Speaker John Boehner announced that the House would vote Wednesday on the resolution requested by the White House to authorize $500 million in funding for the Syrian “rebel” forces being trained by the CIA and Pentagon. The resolution would be offered as an amendment to a measure providing funding for the entire federal government from the beginning of the new fiscal year on October 1 through early December. Both the House and Senate must pass such a “continuing resolution” to avoid a partial shutdown of the federal government like the one that took place last year. (1) Defending the Syrian people from attacks by the Islamic State of Iraq and the Levant and securing territory controlled by the Syrian opposition. (2) Protecting the United States, its friends and allies, and the Syrian people from the threats posed by terrorists in Syria. It is not clear whether the Obama administration will accept this language, which makes no overt reference to training the Syrian rebels to fight against the Assad government, the real goal of the US intervention.